Note from Editor: This project is another in our Tribute to Tinplate(tm)" series, a tribute to the tinplate villages that were served by tinplate trains in the early 1900s. This month's projects are a way of getting ready for the summer season. 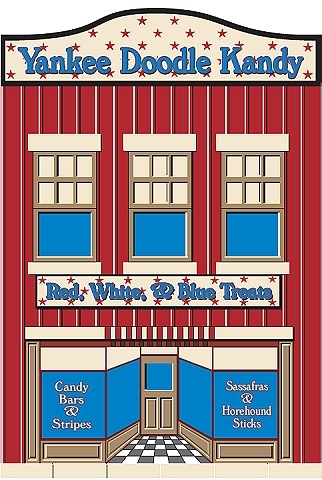 Like the original Building Tinplate Storefronts project, this project was inspired by a series of candy containers that were made in the early-to-mid 1900s by West Brothers. Each container included a glass full of candy that you could see through the house's "windows." A photo of the one of the original tins is at the left. To create the lithographic-style graphics, I worked from photographs of the originals as much as possible to reproduce the architectural details and the fake 3-D entrances. However, I increased the size of the buildings, to look right with our trains and villages. I also added extra details to keep the buildings from looking too plain at the larger sizes. If you sign up for our Trains-N-Towns(tm) newsletter, we'll let you know when we create and upload more storefronts or other projects you might find helpful. After Paul and I started creating our first Tribute to Tinplate(tm)" buildings, we both started combing the Internet for photographs of worthwhile projects. Once we got started with storefronts based on the West Brothers' candy boxes, it wasn't hard for Paul to keep imagining new versions. I suspect that he may eventually have a set for every major holiday, which would be even more justification for leaving your "train set" up all year long. 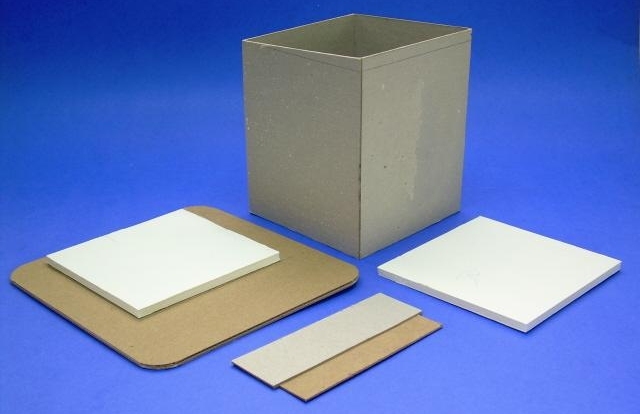 Clean solid cardboard, such as from cereal boxes or posterboard. I especially like to use a thick cardboard, like the back of a writing tablet. Elmer's white Glue-All or similar white craft glue that dries clear. A glue stick would also come in handy. Access to the Internet and a color printer. Clear glossy acrylic finish to help give a metallic appearance and protect the graphics when you are finished. Although my Marx trains run on O gauge tracks, they are closer to S scale (1:64), the scale of S gauge American Flyer trains, and many collectible village houses. So I chose that scale to build these projects. 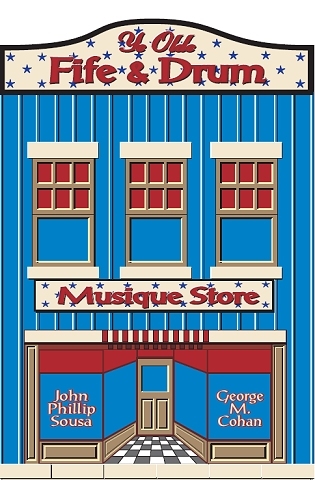 However, Paul has been getting requests to offer his graphics in other scales, so he has added graphics in 1:39 (the largest scale you can print these on 8.5"x11" card stock) as well as O scale, HO, TT, and N. If you choose a scale other than S or O, you'll have to adjust the measurements for the plans accordingly. If you want to be certain your project will look right with your existing equipment, consider doing a "mockup" first. Print out a copy of Paul's graphics in black and white (saving your color cartridges). Then cut and fold the printout to make a mockup you can set next to your trains and other accessories before you begin the final structure. This project has a structure pattern that you will need to cut out and transfer to cardboard, as well as graphic sheets that you will use to finish the building's appearance. Note: For this project, we have provided the patterns in S scale, the scale we used for this project. The plans include the size for O scale as well. If you need other sizes, please contact Paul. You may print the structure pattern on any sort of paper, since you're simply using this to transfer the plan to your cardboard medium. However the "lithograph" graphic should be printed on acid-free heavy paper or card stock. Note that Plans 1a and 1b are meant to be spliced together before you transfer the pattern to the cardboard. Then navigate to the folder where you saved the files and click on the file name. Adobe Acrobat Reader should open up. Make certain that the graphic is set to print at 100% ("scale to fit" or "fit to page" should not be checked). To help you decide which building to start with, I've supplied medium-resolution jpeg versions of the building faces. If you click on the little thumbnail, you'll see a version big enough to see clearly. However for the actual project, please download and print the pdf versions from the text boxes below the thumbnails. These patterns are from another feature, so you'll have to trim them to size after you download them. Though I like the staggered pattern best, I did one of each of these, just for variety. Which one or ones you use is entirely up to you. It was common on tinplate structures to change up even the insignificant patterns when redrawing the graphics, so don't worry too much about consistency. 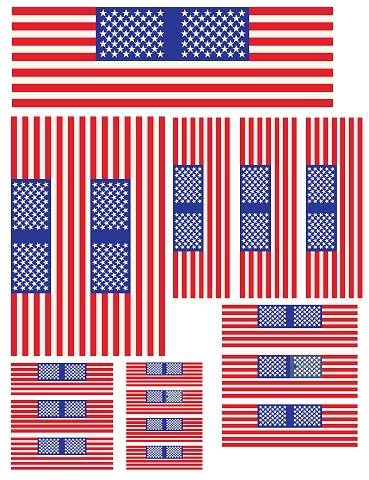 To help you decide which flags you like, I've supplied medium-resolution jpeg versions. If you click on the little thumbnail, you'll see a version big enough to see clearly. However for the actual project, please download and print the pdf versions from the text boxes below the thumbnails. A note about Copyright - However you use these plans and graphics for your personal use, please keep in mind that the lithograph-style graphics are copyright 2010 by Paul Race and are not to be copied, re-used, republished, or repurposed without prior permission and appropriate credit. Commercial use without prior permission is illegal and expressly forbidden. Big Indoor Trains(tm) is a participant in the Amazon Services LLC Associates Program, an affiliate advertising program designed to provide a means for sites to earn advertising fees by advertising and linking to amazon.com. Paul likes making resources like this available to hobbyists, but they are expensive and time-consuming to produce and publish, and it's frustrating to see other folks profiteering off his hard work. In other words, if you like having this kind of resource available and you'd like to see more, please respect the creators' rights. You will save time and sanity in the long run if you print the graphics in low-res B&W first to make certain that the are the right size for the plans you have printed out and that they are the right size to go with the rest of your equipment. Remember, when you score and fold the frame pieces, the "fold lines" of the graphics should be a tad wider in each direction than the pieces you cut out, because you need to compensate for the thickness of the cardboard you are using. Paul's wall graphics also extend the wall pattern beyond the fold lines to compensate for any minor differences. The best way to be sure you have plans in the same scale as your graphics is to fold the graphics along the fold lines, then cut them out and hold up to the frame pieces. Again, the frame should be slightly smaller, especially horizontally. If it isn't, adjust the size when you transfer the plans to the card stock. 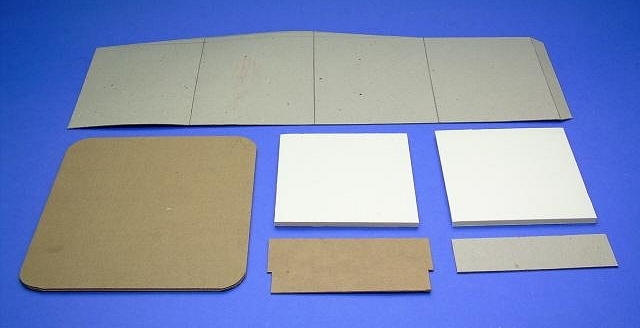 Once you have transferred the plans to the cardboard you will use for a frame, use a Xacto-type knife and a straight edge to carefully score every place where a fold is indicated. Then cut the pieces out and fold them into a square. Now it's time to temporarily fold the B&W graphics around the walls as a "sanity" check. If it helps you to actually put one together this way, go for it. Engineers have a saying "build one to throw away, you will anyhow." The photo to the right shows the four walls glued together. It was my idea to make the "sidewalk" in front of the building into a "boardwalk." This will eventually give you a very nice place to set figures, fire hydrants, lamp posts, and the like. I made the base by laminating two pieces of the thin corrugated cardboard from Express Mail packages. You could laminate "matte" cardboard as well. The foundation should fit loosely inside the four sides of the building once it is assembled. Eventually, it will give you more surface for gluing the building down to the base reliably. That said, you don't want to glue the foundation to anything until the building is complete and you have checked the fit one last time. 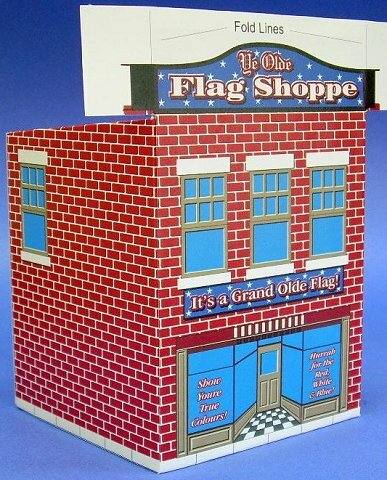 Technically, I could have made each storefront from one big piece of cardboard, including room for the "crest." As it turned out, it was easier for me to build the crest separately and fasten it onto the building front after I had the four walls glued together. I also added an extra layer of support to the crest, since it would be sticking out and more prone to "bumping." Plan 3 shows a side view of how I layered these pieces. By making three of these at the same time, I could work on one while the other one was drying, and so on. Let the building frames dry at least overnight before you start applying the graphics - the last thing you need is a joint popping or the frame getting wobbly while you're trying to be precise with the graphic. Then I carefully applied the graphic wraps to one wall at a time. I started on the sides, then did the back and front. I could have started with the back just as easily, but the front definitely has to come last. At my insistence, each of Paul's graphics includes a little bit of extra material at the edges to take up any "slack" in case your measurements are an eighth of an inch off or something. Before you cut off the fold lines, hold the wrap up to the wall it is going onto and see how close the fold lines are to the actual corners. If they're close, fold the first wrap (a back or side) along one fold line, then hold it against the wall you will be using it on. Then, if it is necessary, you can adjust the other fold. When you're certain your fold lines are where they need to be, crease them sharply and cut the white parts off of the graphic. Spread a thin layer of glue over the entire wall to be glued, and along the edges where the extra bits will wrap around the corner. Then fasten the graphic down carefully. Consider using clothespins or the like to make certain the wrap doesn't shift during the drying process. Once the first "wall" has dried, you add the next wall, except that one of your "fold lines" on the next wall should actually be a "cut line" if your graphic pages are fitting where they need to be. On the last wall (probably the front), both "fold lines" should be cut lines, but make certain both cuts align perfectly with the corners of the building. Because I didn't cut the crest's shape out ahead of time, the building's crest looks a little funny at first. I could have cut it out, I suppose, but then I'd have an extra variable while trying to align the graphic for the store front with the left and right edge. Or worse yet, I'd discover that I had cut the crest shape wrong and have to start a building all over again. When the glue for the front has dried completely (meaning overnight at least), use a very sharp Xacto-style knife to trim the crest to match the shape of the graphic. Don't rush this job or try to cut all the way through both layers of cardboard on the first pass. Instead, make many light passes. To finish the inside edge of the walls, I mixed a color matching the walls, painted strips of cardboard, and installed them all the way around the inside. Once you have the structure glued together and all graphics applied, cut out a piece of corrugated cardboard or foam core to fit just inside the walls. Choose and apply a roofing pattern, and when it is completely dry, fasten the roof in place. I fastened mine about an 1/8" down from the side and back walls. I actually applied the glue from inside the building, then brushed it into the seams where the roof fit the walls. When all the graphics are applied, take a marker or fine-tipped brush and touch up the edges of the cut graphic media with a color that is compatible with the siding color. Once you have tested all of the fits, it's time to glue your structure(s) together. Double-check the fit of the foundation inside each building, then glue it onto the base. I'd give it a few minutes to set before gluing the building down on top of it. Again, the hurry-up-and-wait aspect of this stage of the project is reduced if you are working on two or three buildings at once. Wait until the graphics, paint, and glue are thoroughly dry (at least overnight, if not 48 hours), then spray the structure(s) with several light coats of a clear glossy indoor/outdoor acrylic finish. This protects the surfaces from moisture and dust and also helps reduce fading. 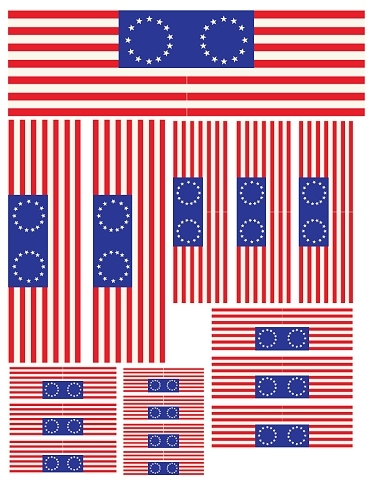 In addition, it makes the lithography pattern "pop." Do not such a heavy coat in one pass that you cause any streaks, runs, or drips, though, or you'll have to start all over. Of course the structures will really come to life when you add accessories and put them into some sort of setting, even a simple one. If you like this project, stay in touch - more are on the way. In the meantime, you might like to take a look at the following projects. 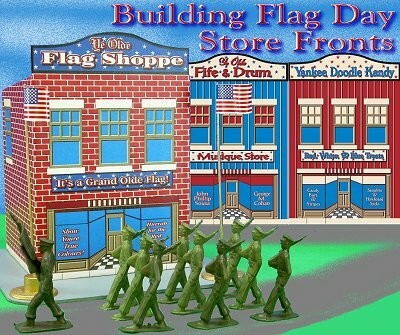 Building TinPlate-Syle Store Fronts - Not one, but three buildings! The West Brothers tinpated candy boxes saved money by using one plan with multiple sets of graphics to get maximum use out of their pattern expense. We've followed their example with projects inspired by three of their most popular buildings. Use our free downloadable patterns and plans to add a vintage-style business district on your railroad or display village. Building a Vintage "Lithograph" Station Our first "Tribute to Tinplate" article pays tribute to the lithographed stations of a century ago. 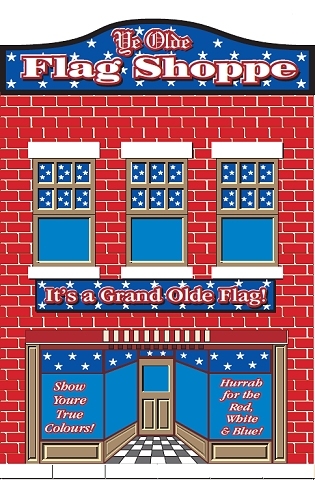 Free downloadable commercial-grade graphics and instructions are available in several scales. A set of Halloween-themed graphics has been added since this project was originally published, as well. Building a Vintage Tin-Style Cottage This project is inspired by a popular pre-war tinplate house that was made to go with standard gauge trains, like the early 1900s-era Ives and Lionel. Our own commercial-quality graphics and instructions, as well as Howard Lamey's plans and assembly details are all free, to give your railroad a vintage tinplate look with a few cents' worth of materials. Many options are available, and most graphics and plans can be downloaded directly from the article. Building (Tinplate-Style) Seaside Storefronts - The latest addition to a new favorite. Sticking with the West Brothers outline, we have replaced the brick and stone with clapboard painted in the colors and themes that brighten coastal towns on both coasts. Colors are compatible with Howard Lamey's Sandy Shores beach-inspired collection. Building a Tinplate-Inspired Lamp Post The ideal accessory for the Lewis Park Station, or any station or city hall on your railroad or holiday village. No, they don't actually light, but they are cheap and easy to build and add a great deal of vintage interest to any setting. Free downloadable plans are available in several scales. Building a Tinplate-Inspired Watchman's Shanty Back in the day before automated crossings, these were common sites alongside busy rail crossings. Howard's exclusive design pays tribute to a series of tinplate structures that go back a hundred years and include three different scales. His free plans and instructions will help you dress up any indoor railroad or holiday village. Building a Tinplate-Inspired Railroad Crossing Sign This is the ideal accessory for the Watchman's Shanty project. 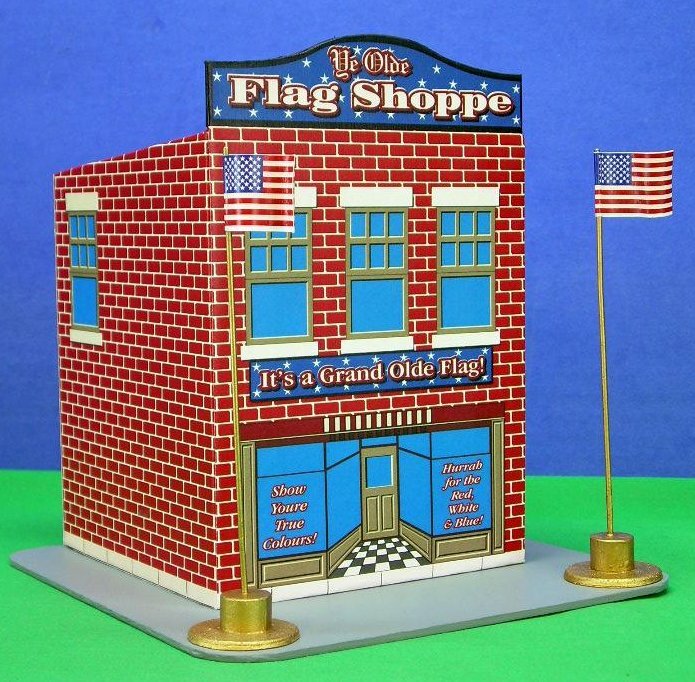 Based on a series of products that are now available only as expensive collector's items, this easy and almost-free project will add texture, interest, and period to any model railroad or holiday village. 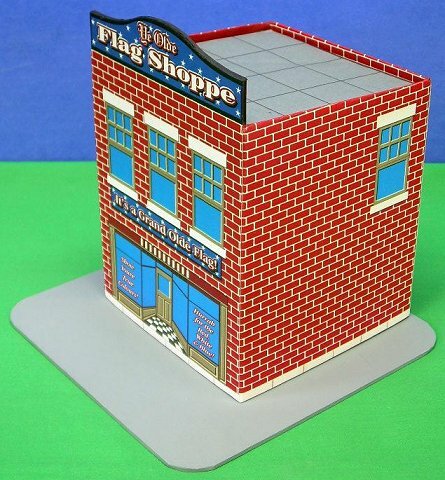 Easy Street Scene - This new building project uses downloadable building graphics and a little cardboard or foam board to build up a convincing downtown scene that is only a few inches deep - perfect for shelf layouts, tight spots, and dioramas. We also provide links to high-resolution graphics that will work for any scale. 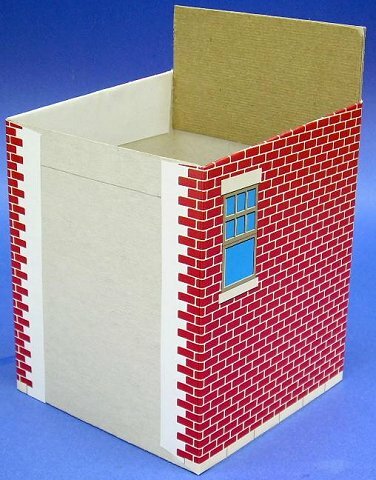 Build a Vintage-Style Cardboard Stone Cottage - This building project is made like the vintage cardboard houses folks used to set around their Christmas tree in the early 1900s (before glitterhouses became common), but its design was inspired by a building that shows up on the "Isle of Sodor." The building uses free downloadable graphic paper to put a realistic stone veneer on an old-world cottage and fence. It works with Christmas villages, or with a little customization, would dress up any indoor railroad. A "brick cottage" option is also included. Build a Vintage-Style Barn and Silo - This building project uses downloadable graphics to put realistic shingles and siding on an old barn and silo. Like the stone cottage above, it works with Christmas villages, or with a few changes, it would dress up an indoor railroad. Building the Union Station - This original project by designer Howard Lamey is inspired by two traditions - the cardboard Christmas houses that were popular in US homes between 1928 and 1965 and the Lionel station that was popular for most of the 20th century. Note: Big Indoor Trains(tm), Big Train Store(tm), Family Garden Trains(tm), Big Christmas Trains(tm), Garden Train Store(tm), and Trains and Towns(tm) are trademarks of Breakthrough Communications (www.btcomm.com). All information, data, text, and illustrations on this web site are Copyright (c) 1999, 2000, 2001, 2002, 2003, 2004, 2005, 2006, 2007, 2008, 2009, 2010 by Paul D. Race. Reuse or republication without prior written permission is specifically forbidden.